With data volumes that need to be handled continuing to ramp up, driven predominantly by heightened cloud computing activity, modern data centres are now mandating implementation of innovative new data storage technology. As a result, architectures that can offer greater flexibility, have lower power budget requirements and are more cost effective are starting to be sought. NVMe-over-Fabric (NVMe-oF) has emerged as the best way forward. Relying on a high performance Ethernet-based fabric, rather than older (and increasingly outdated) PCIe-based fabrics, this is much better able to deal with the array of different complex workloads that cloud and enterprise data centre operations are beginning to face. Introduced in the summer of 2018, Marvell’s 88SN2400 is recognised as the industry’s first NVMe-oF SSD converter/controller IC. It has the ability to transform standard NVMe SSDs into SSDs that fully support NVMe-oF. As a consequence, these ICs can dramatically increase the utilisation of available data storage resources and boost overall performance, as well as facilitating the scaling up of resources to meet elevated demands when they arise. 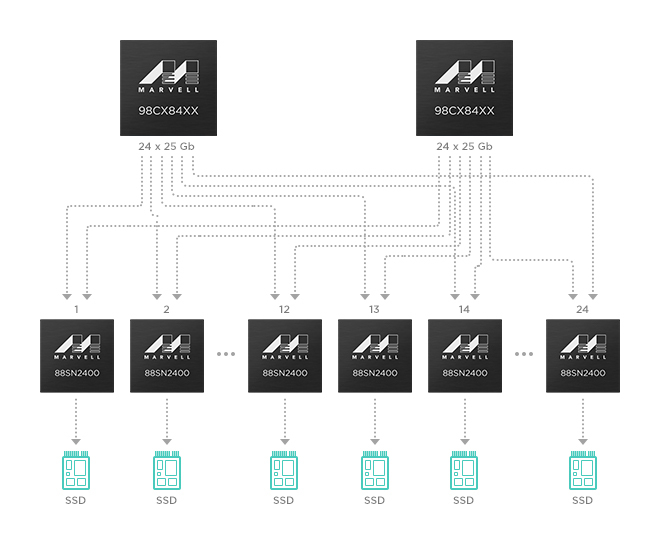 Delivering low latency access across the entire fabric and making the full extent of the SSD bandwidth available for use, the ICs support the complete disaggregation of data centres’ compute and storage infrastructure, thereby enabling a more flexible software-defined resource that has considerably better efficiency, with both significantly lower associated capital and operational costs. When deployed in a typical high-end 2U24 shelf comprising Gen3x4 SSDs, each IC can support up to 18M input/output operations per second (IOPS). It means that data centre infrastructure will be inherently more versatile and adaptable, allowing changing workload requirements to be addressed via use of optimised scalable units of disaggregated flash storage and storage class memory (SCM). Keeping deployment as straightforward as possible, the 88SN2400 can be attached to existing backplanes. It thereby allows the numerous benefits of NVMe-oF architectures to be realised, while using legacy NVMe SSD infrastructure.